Justin Timberlake is shortlisted for a major BBC award. The American global superstar sang Can’t Stop The Feeling as part of the interval act during the 2016 Eurovision Song Contest. 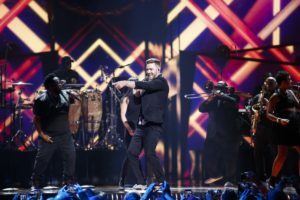 Some questioned the idea of the idea of 2016 SVT producer Christer Björkman, but it has paid off for Justin Timberlake. Votes close at 8pm GMT (21:00 CET). You can show your support for Justin Timberlake, or any of the other artists, from within the United Kingdom online or by SMS, more information is available on bbc.co.uk/musicawards.